The thing about treating arthritis is you’d better do it. If you’re not lucky enough to have a form that readily responds to treatment or if you didn’t get early treatment, your arthritis will progress and create an incrementally worse situation for you. Given that we’re discussing arthritis, we’re talking loss of mobility somewhere, maybe in your legs or hands, and pain. 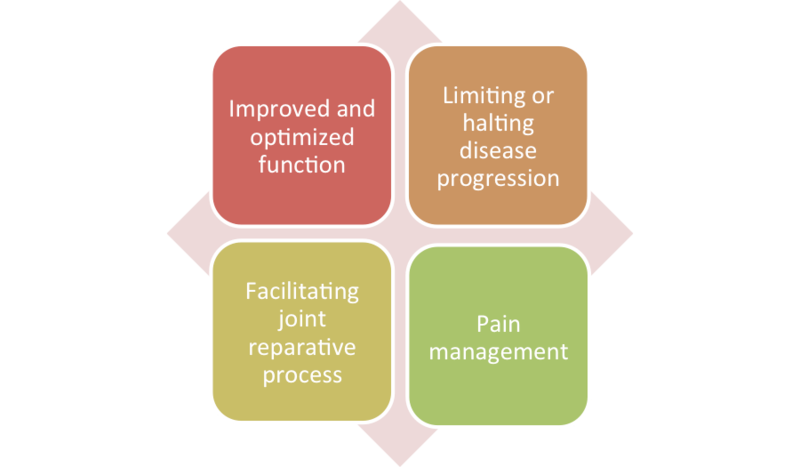 Treatment considerations for arthritis fall into three general categories: lifestyle changes, medication and surgery. Let’s review each. The best time to enact lifestyle changes is before you’re struggling to return to normalcy. Exercise is a lifelong habit that will improve the quality and extend the quantity of your life. For starters, exercise maintains and improves muscle tone. It also strengths your bones and cartilage. This will reduce pain, fatigue and stiffness over the long term. Exercise should include a tolerable level of aerobic activity, flexibility exercises to sustain your range of motion and strength training to maintain and improve your muscle tone. Physical therapy is another component; massage, heat and ice application, splints and other treatments are important in maintaining blood flow, mobility and positioning as stiffness and deformity increase over time. Using medication for arthritis is a very delicate act. Many if not most arthritics are aging and may have other medical issues. Medications in these settings have risks for side effects and drug interactions, including kidney, liver and heart damage, stroke, ulcers and bleeding. Any medications should be coordinated with your physician. Typical over-the-counter (OTC) medical regimens begin with acetaminophen, then move to NSAIDs (non-steroidal anti-inflammatory agents such as ibuprofen, aspirin or naproxen). When OTCs don’t work, your doctor may prescribe medicines, including steroids and other medications called biologics, immunosuppressants and DMARDs (disease-modifying anti-rheumatic drugs). These drugs all are effective in certain patients but can have serious side effects. Surgery is an option if and when other therapies haven’t worked and if the patient is healthy enough to have it. There are two primary options. Arthroplasty rebuilds the joint, and joint replacement starts from scratch. Let’s start back where I’ll always hope you start: prevention. Here are some lifestyle change tips for holding off the onset of arthritis or slowing down its advance. If you are overweight, do what you can to slim down. Weight loss significantly reduces joint pain in the legs and feet. Eat a healthy diet full of fruits and vegetables. Among other things, a rich supply of vitamin E yields benefits you’ll need. Also eat foods rich in omega-3 fatty acids (e.g., salmon, mackerel, herring, flaxseed, canola oil, soybeans and soybean oil, pumpkin seeds, and walnuts). Sleeping eight to 10 hours a night and taking naps during the day can help you both prevent and recover from flare-ups more quickly. Try stress-reducing activities, such as meditation, yoga or tai chi. Change your home to make activities easier (e.g., grab bars in the shower, the tub, and near the toilet). Consider capsaicin cream over your painful joints. Typically expect improvement after three to seven days if it’s going to help. If and when you develop arthritis, it’s going to be a tough time. Get ahead of the challenge and take care of yourself in advance. Feel free to ask questions or leave comments.